Just like before, Hong Kong RFID has been active in the jewellry industry with our renowned Jewellery Management System Xapphire™. 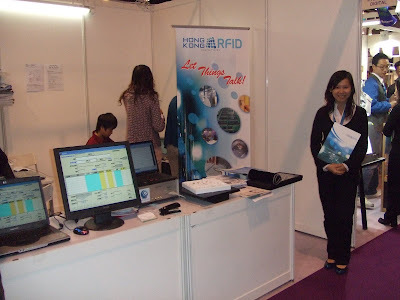 The application of RFID-enabled JMS has been focused on wholesaling, inventory checking and internal logistics operations. In December 2008, together with our partner, EverTech, we joined the Jewelry Manufacturer's Associations exhibition in Hong Kong Convention & Exhibition Centre. In the exhibition, we provided demonstration of our system showing jewellers from all over the world how RFID technology can apply in their operation and smoothing the flows. Besides, many of our customers used our system in the show and they realized the efficiency and effectiveness of the system. They are satisfied with our products, and we got a very good feedback from our customers. With the advanced software of our partner, a lot of exhibitors who are jewellery wholesalers and retailers express interest in our equipments. Through the demonstration, they can easily understand the operation of JMS and experience the benefits brought from our system. The exhibition was successful and it brought us a great chance to expand our JMS business to more places. We have already begun follow-up work for the inquiries we got from the exhibition and we look forward to the fruitful results.